Tom Jacoby says "Help Your Future Customers!" (1) Your website must be search engine-friendly so that the Google and the rest see your exact product and service as you intend. If Search Engines don't get you then you will not be found in search engine results. Contact me if any question about this. (2) Make How-to PDFs and YouTube videos to offer to your targeted public. People are used to exchanging their email address for useful information. (3) Share your knowledge and expertise on your website as well as on social media and your blog. When you assist someone it is likely that they will think well of you. The internet is an abundance of communication lines. Offer information to attract those who are interested in your products or services, communicate to them about their interests, inform them or help them and you are building a relationship. Your website and social media become sources of informative material in your area of expertise. This attracts people who are looking for what you offer. Collect email addresses in exchange for How-to PDFs. Ultimately, your business becomes the authority in your field, the experts, the people in the know. When it's time to buy, it is likely that many of the people who have benefited from your help will buy from you. The internet is the largest marketing platform in the world. 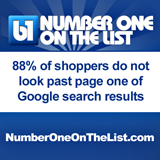 Everyone searches for everything they need and want online. Your website should be prominent where Buyers are looking. Copyright (C) 2013 Emanation, Inc - NumberOneOnTheList.com All rights reserved.